If you blog on your professional site, chances are you're hoping to land more writing gigs from your blog. And you're not alone. The marketing benefits of blogging aren't exactly a secret. That said, I often see freelancers start a professional blog only to give it up after a few months. Part of the problem seems to be a matter of instant gratification -- we're so used to it (especially online) that if something doesn't provide near-immediate results, we can find it easy to walk away and try something else. It's human nature I suppose -- walking away from something as soon as it's no longer all fun and new and living up to our unrealistic expectations. That's rarely smart. It holds us back from better things (which we only find when we put the work in). Plus, it's a downright foolish way to run a business. Rather than hanging up your blogging boots because you aren't seeing those immediate results you were hoping for, why not work to improve your blog instead? You'll build something stronger and more valuable from a marketing perspective. And you can bring in enough prospects to keep you busy, even without traditional pitching if that doesn't suit you (it certainly isn't how I prefer to land gigs). The first step? Be realistic about what a blog can do. For example, you can't expect to write a handful of posts and have dozens of prospects beating down a path to your door immediately as a result. Blogging is a cumulative marketing tool. And while every post is a promotional opportunity in its own right, the longer you stick with it the harder your collective blog will work for you. But if you want to get there, you need to take it on a post-by-post basis and make the most of everything you write. You can improve your freelance writer blog and its ability to attract and convert prospects with five simple steps. 1. Have a goal for every post. Remember that your professional blog is about clients and prospects -- not you. So while it's okay to occasionally post promotions or news, a blog that brings in freelance writing clients should be focused more on helpful content, giving your target clients something they want to read. A problem is simply a negative situation your target clients are facing -- something getting between them and their goals. Your blog posts should help them overcome those problems. An opportunity is a chance for your readers to see a benefit they currently aren't realizing. And your blog posts will help them take advantage of those circumstances. When you give each post on your professional blog a goal that addresses one of these two things, you turn them into resources. You also get to showcase your expertise in a way that makes you not only look more authoritative, but also more trustworthy -- exactly the kind of writer clients are happy to pay good money to work with. This often involves teaching your readers something in each post. It might also mean offering tips or advice. Or it can even mean writing informative "explainer" posts to help prospects understand blogging / copywriting / research / etc. fundamentals or certain project types. 2. Speak to your prospects. It's not enough to teach or explain or solve a problem though. 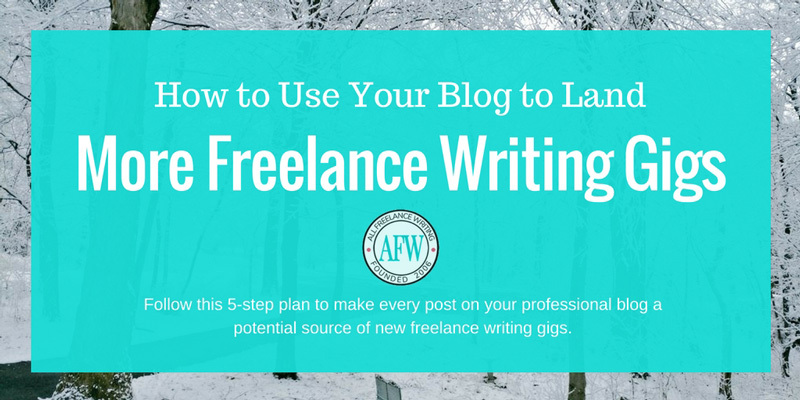 If you want your blog posts to help you land freelance writing gigs, it helps to put a bit of yourself into them. What I mean by that is write like you speak (at least to some degree). Write as if you're speaking directly to your prospects -- to that one individual reader in the moment. It's about building trust by giving potential clients a glimpse of what you might be like to interact with one-on-one if they decide to work with you. Pretend the problem or opportunity your post tackles came to you in the form of a prospect's question via email. Write as if you were responding to that email. It can help you get the POV and tone down quickly in the way you would actually speak to clients. Then you can expand upon that and format the post in revisions. 3. Include a call-to-action (CTA). Now let's say you've written an amazing blog post. 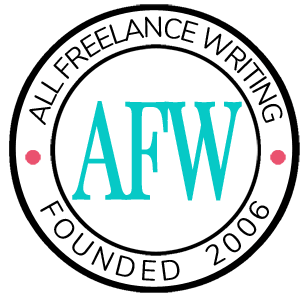 It solves a very real problem your freelance writing prospects face. It's written in a style that speaks to them and that they find appealing. Does that mean your reader is going to be left thinking about hiring you? Leave readers hanging after giving them the content they came for in the moment, and they might just close the page and move on to the next thing they wanted to do, or read, or look up. If you want prospects to hire you after reading a blog post, tell them what you want them to do. Ask them to contact you. Offer to give them a quote on a service related to that post (ideally every post will be related to a specific service you offer). Tell them you're the writer to carry out the solution you proposed in your article. Close your posts by prompting your reader to take action. That's how you go from having a casual reader or passerby and end up with a warm lead ready to reach out and hire you. Maybe you have the perfect post. It solves a problem or helps the reader explore a rewarding opportunity. Your style is right-on for your target market. You have a CTA that you're confident will drive conversions. How valuable is that post if you don't get eyes on it? How valuable is that post if you don't the the right eyes on it? That's where search engine optimization (SEO) comes in. And it's one of the places where I often see freelancers stall. But if you write posts, and you don't get that post in front of people looking to hire writers like you, then why are you wasting your time? A professional blog isn't an exercise in ego. It's a tool. And one of the best ways to use that tool is to target every post to a different keyword phrase potential clients might use when searching for a writer. This way, when they search Google looking for a copywriter / blogger / whatever-kind-of-writer-you-are in their industry, there you'll be. When you optimize your posts and get them ranking well in Google, they won't provide immediate traffic. Those rankings can take time. But once you do earn them, they'll continually bring in new leads. Now multiply that by a post per week for a year. Sometimes ranking for a single keyword phrase will bring in more leads than you could even take on (what happened with my site for years). And sometimes you'll target more keywords that only bring in a lead or two per month (and yes, some will flop). But when you have a dozen or so posts all bringing in a lead or two each month for pro-level projects (not piddly one-off gigs), that can also work out to more leads than you can take on. And that not only leaves you in a comfortable place, but it gives you the ability to be even more choosy about the projects you want to take on and the people you want to work with. Optimize your posts for search engines. Every one of them. If you can get your professional blog posts ranking well in search results, that's great. But like I said earlier, it can also take time. And this is the other place where I see writers give up too soon on their business blogs. Sometimes optimizing posts is all a freelancer does, expecting leads to start flowing in. And in time they might. But that isn't the only kind of promotion you can (or should) do. Again, you have to get your blog posts in front of the eyes of potential clients if you want that blog to be an effective marketing tool. So after you've written and published a helpful, informative, appealing, high-converting blog post, get out there and actively promote it. If your social media profiles are focused on your professional network (with potential clients, not colleagues), promote your post there. You can have an email subscription option available to put your posts in your prospects' inboxes (just convince them to subscribe on your site). If you can do so tastefully, you could even use a particular blog post as a reason to reconnect with a former client (share something you think they'd love), or you could do similar by including custom content recommendations in email pitches to new potential clients. Your blog goes hand-in-hand with your overall network and visibility. The more you put into building a network and connecting with potential clients, the more prospects you can get each post in front of. And the better your blog, the more it can do to help you expand that network and, ultimately, convert those prospects into paying clients. But don't think of it as a Catch-22 where you need one to build the other. Think of them as two tools at their best when you build them concurrently. It can sound like a lot to think about -- what each post should revolve around, having a direct call-to-action for every one, optimizing your content, and actively promoting it for the quickest returns. But once you put together a system that works for you, and you get in the habit of sticking to it on a regular basis, it'll start to feel like second nature. That's the gist of what each blog post on your professional blog needs to do. Are yours? Do you have any additional steps you include to land more writing gigs from your blog? Tell me about them in the comments.